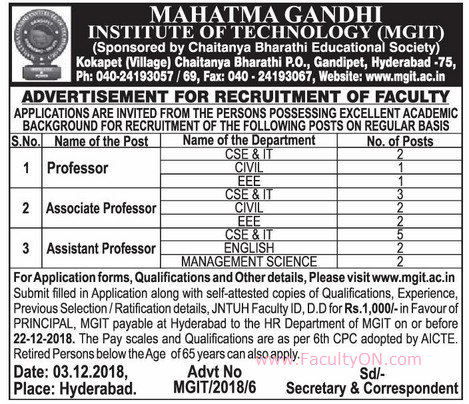 Mahatma Gandhi Institute of Technology, Hyderabad has advertised for recruitment of Professor / Associate Professor / Assistant Professor jobs vacancies. Interested and eligible job aspirants are requested to apply on or before 22nd December 2018. Check out further more details below. Name of the College : Mahatma Gandhi Institute of Technology, Hyderabad. About College: Mahatma Gandhi Institute of Technology is one of the premier Engineering Colleges in the Self-Financing category in Andhra Pradesh. MGIT is affiliated to Jawaharlal Nehru Technological University, Hyderabad. The institute has recently received accredition (Received accredition for 3 years for all 6 Bachelors Programs)status from National Board of Accredition, New Delhi. How to apply: Please follow the instructions provided below.